Is It Time to Officially Coronate Lebron James? For the first time in his glorious career Lebron James will finally get his ring. After certainly being one of the most polarizing figures in sports, Lebron led the Miami Heat to its’ second franchise world championship. Coming out of high school, Lebron was crowned with the moniker “King James” but this is the first time where he’ll actually be sitting atop the throne of the NBA as a champion. This isn’t about how many MVPs he has won, this isn’t about All-Star appearances, this is only a taste of what separates you from the rest. Lebron will no longer be mentioned in the same breath with Charles Barkley, Karl Malone, John Stockton, Patrick Ewing, and other all-time greats who will never know what it feels like to hoist the Larry O’Brien trophy. This is Dwayne Wade’s second time hoisting the trophy with the first being back in 2006.Lebron’s decision to take his talents to South Beach on national television broke a lot of hearts in Cleveland and was met with a level of hate and scrutiny that we may never witness again. 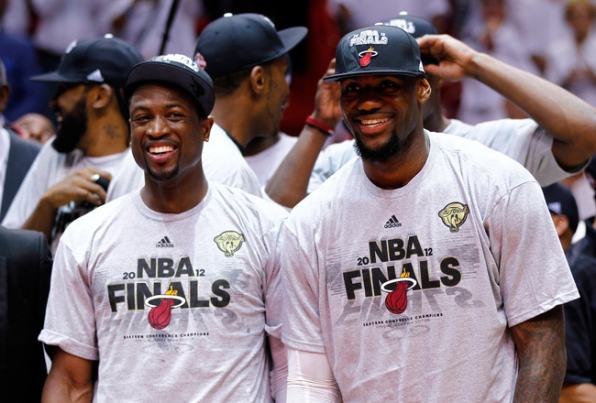 Though it all paid off for Lebron, Wade, Bosh, and the rest of the Miami Heat organization, the next step will be if they can repeat. This entry was posted in Media, Sports and tagged Blended Entertainment, Chris Bosh, Dwyane Wade, Lebron James, Miami Heat, Mike Miller, nba, Sports. Bookmark the permalink.